Our Sunday Internet Auction #1052 offers a fantastic selection of 410 New Items, along with 125 Special No Reserve lots and 30 Vault Value items. The Majestic $10 Liberty Eagle Gold Collection contains an assortment of dates, many with low mintages. 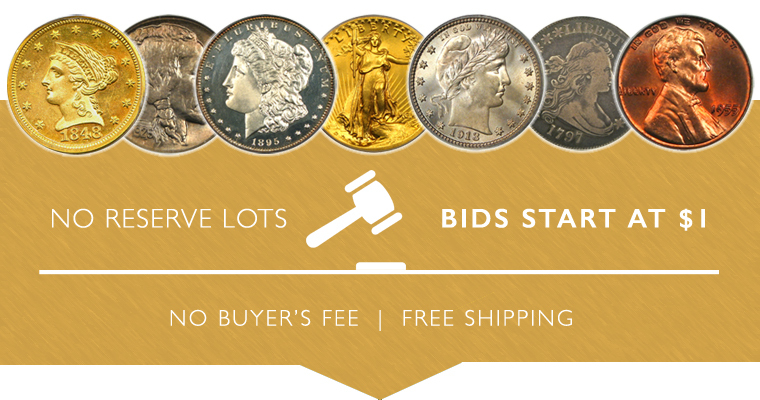 While it doesn't boast any "Finest Known" examples, the variety and quality of each of the coins is far above average, and this collection is full of ideal pieces for the collector. Our first highlight is a 1921 Morgan $1 PCGS MS67. This piece has gorgeous silky surfaces with a light golden rim tint. Tied with 16 other pieces as the finest known, we think that the coin is certainly deserving of a shot at 67+! This week's second highlight is an 1800 $5 PCGS XF45. This coin is a popular early half eagle from the early 19th Century. The third highlight is an 1870 $10 PCGS AU55. An extremely scarce date from a low mintage of just 3,990 pieces. This example has flashy surfaces with beautiful luster. There are only seven pieces graded finer by PCGS. The final highlight is an 1891 $10 PCGS/CAC MS64 (OGH). This piece has lustrous, original surfaces with a nice skin and comes from a low mintage issue of just 91,820 coins struck. Scarce in high grades -- just four coins finer at PCGS, our example is CAC approved for quality. Of course there are many other highlights, so be sure to browse all lots in this exciting new sale before it closes on Sunday, February 17th.